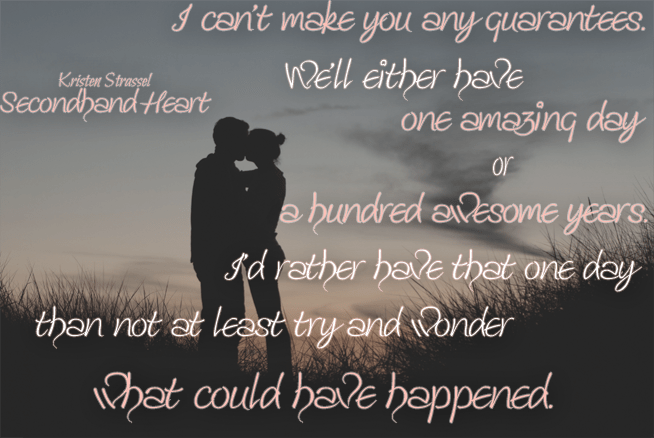 Happy Book Birthday, Secondhand Heart! Aaaah! It’s here! There are so many steps to completing a book, and the release day always seems so far in the future. But it always sneaks up on me. I’ve been talking a lot about this book lately, of course, and I hope that you enjoy reading it as much as I’ve enjoyed writing it. This is a book of firsts for me. It’s my first contemporary romance. It’s also the book that made me decide to go totally indie. It’s scary to go in a completely new direction, but it’s really exciting, too. I hope you’ll check it out. It’s available on Kindle Unlimited, and of course, to own. If you like it, please tell a friend. All of your friends, actually. And a few strangers. I’ll leave you with another excerpt, and later this week when I’m done with this movie (we’re finishing up with overnights, even tonight), I’ll be able to crack open some champagne! I didn’t think anything else could shock me this week. I had so many things I wanted to say right now, but as they crashed together in my head, they didn’t work when I tried to say them. “I love you, too.” His face brightened at my words. It was true, I loved him for some of the very same reasons he loved me. I always thought when I finally said it out loud, I’d feel like I was leaving Jordan behind, but I didn’t. He was coming along for the ride. And Cam was okay with that.